A lack of quorum had already forced Egypt’s parliament to recess for 30 minutes when Speaker Ali Abdel ‘Al decided to call for two successive votes by show of hands and two more votes via standing in agreement. The absence of a live feed of the session hid the absurdity of Abdel ‘Al and his lieutenants determining the outcome of votes in a sea of hands, sometimes two to an MP. The entire process was reported to have taken 15 minutes in total. The word “reports” is key because, like a majority of the laws passed by the parliament after March, no formal record exists for the vote in question. It was around the end of March when Abdel ‘Al unofficially decided to eschew the electronic voting system, though this was hardly his first move against greater transparency. By the time vote tallies were done away with, the live feed of the sessions had long since been cut and parliament-focused news sites had resorted to analyzing grainy photos released on days photographers were allowed to take pictures of the proceedings. Few observers predicted that the parliament would effortlessly step out of the shadow of its less-than-democratic past iterations. Nevertheless, this parliament was the final step on the transitional roadmap to civilian rule laid out after Muhammad Morsi’s ouster. It was given greater powers than any other parliament in recent Egyptian history by the 98 percent of Egyptians who ratified the 2014 constitution. It was intended to serve as the counterweight to the neo-pharaonic tendencies of the executive branch. Such high levels of empowerment and responsibility bred high expectations. 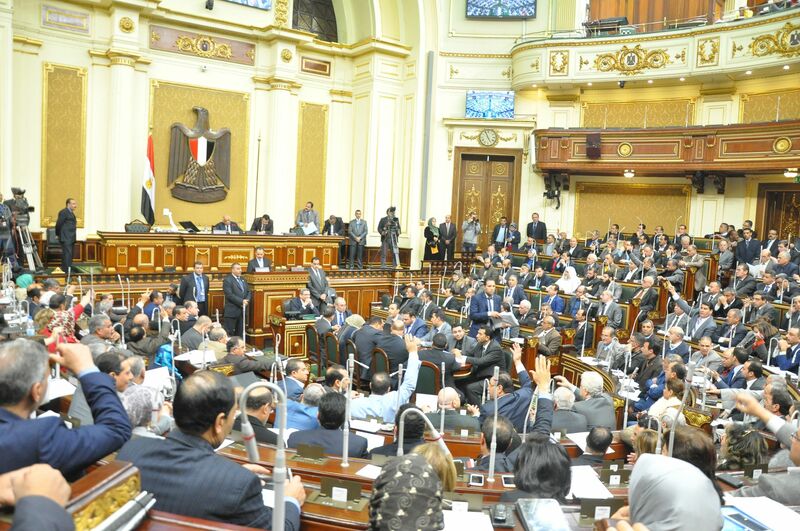 However, looking back on the first session, this reversion to voting by show of hands or standing in agreement does not inspire confidence in the parliament’s ability to fulfill its mandate from the Egyptian people. There is nothing inherently undemocratic about voting by standing or by show of hands as legislative practices. The practices do hearken back to the voting procedures of legislative bodies under former President Hosni Mubarak, but, no matter how disconcerting they are, they are legal. Article 320 of the new parliamentary bylaws (ironically voted on by a show of hands) allows the parliament to vote using the electronic system, show of hands, or standing. The precision afforded by one of those measures compared to the other two is immediately striking, but does not necessarily guarantee better governance. Even the United States has not yet devised an electronic system that prevents habitual legislative voting fraud. Thus, it is not the method itself, but the types of actions encouraged by it that must be further scrutinized. The immediate problem with Abdel ‘Al’s decision to discontinue use of the expensive four-button voting panels is that it casts doubt on the validity of parliament’s decisions. In a parliament of 595 members, the difference between 380 and 393 standing members may be slight when observing the mass in motion, yet under certain circumstances it can have vast ramifications for the legality of legislation. That may be a moot point, however, if quorum is not also met. This proves worrisome because the information available through news sources indicates roughly half of general sessions through mid-August were postponed for lack of quorum. Reports of ghost quorum—including a session in which the first electronic roll call revealed only 288 of the required 299 legislators were present so Abdel ‘Al called the roll six more times in succession, until the number mysteriously jumped to 318 MPs present— have done nothing to allay fears of the questionability of votes. A small group of oppositional parliamentarians, like Haytham al-Hariri and Ahmed al-Tantawi, have taken offense to the undemocratic, and perhaps illegal, nature of these developments. The contingent began expressing their concern on the issue as early as the beginning of March and have continued to attempt to bargain with Abdel ‘Al to resume more transparent methods. However, Abdel ‘Al has dismissed oppositional voices in general and maintains his personal preference for the faster voting methods. Because of this, laws have continued to pass under dubious circumstances with only an assumed majority of parliamentarians acquiescing to them. Voting by standing or by show of hands is advantageous for some legislators and demonstrates another problem seen in the parliament’s actions during this first session. Those parliamentarians not protesting the practice are presumably aware that the inherent lack of transparency in this method protects them from public scrutiny. With no official voting or attendance records, the performance of each member can only be judged on the services they bring their community, thus encouraging a return to Mubarak-era corruption and cronyism. Parliamentarians have made media statements about their voting strategy prior to meetings and sessions, but there is little evidence to separate their actual record from their public image. Even safeguards against this kind of legislative secrecy, namely the live feed of parliamentary sessions and the presence of journalists in the hall, have been curtailed. At its core, all of this robs Egyptians of the political transparency they called for in their constitution. Individual parliamentarians are not the only ones benefiting from this system. The majority bloc, the Coalition in Support of Egypt, can be assumed to be profiting from this voting method as well, although lack of voting records prevents a direct analysis. The diverse coalition of interests, held together by either the state security services or pro-government fervor, has found whipping the necessary votes difficult in crucial situations. They reportedly lost a deputy head of parliament position, one of the top three leadership roles, due to a divided caucus. Speaker Abdel ‘Al, a leading member of this coalition, has the power to nullify that dysfunction by opting for votes by methods like show of hands. A quick vote by imprecise means would allow Abdel ‘Al and the coalition to claim victory by virtue of their relative size without having to garner all the votes legally required to effect their legislative vision. Yet this method of legislative dominance perverts the goals of a parliamentary system and, if accurate, is a betrayal the intent and expectations of the Egyptian people. The effects of this voting procedure are quite visible. Several laws important to the executive have been slammed through ahead of constitutionally required or economically necessary legislation that has received a much more thorough, even bureaucratic treatment. Drafts of a mandated transitional justice law, for instance, languished in committee for three months before being heard from again, while a law giving the military power to secure public facilities and try violators in military courts was amended and enacted in only one month. The final draft of the mandated Church Construction Law went from a bill to a law in three days thanks to the looming specter of the end of the session. As this and the opening example of four laws in 15 minutes demonstrate, the comparative speed at which some of these laws can supposedly be debated and voted upon using this system is breathtaking. This does not mean that every law passed by the parliament thus far has followed this pattern. However, the illiberal doors opened by this trend portend a continued slide toward rubber-stamp legislating. Regular reliance on a system that downplays quorum, dismisses negotiations within ruling coalitions, and conceals individual voting records will not encourage the vital political debates that must be had in the coming years. Egypt’s completion of the democratic roadmap was a step in the right direction, but it was not the only step that must be taken. Egyptians and international observers must continue to closely monitor and pressure the parliament to live up to its electoral mandate of transparency and accountability in the next session.